If you would like to use these features, all you need to do is download the Cart66 Members add-on and install it. 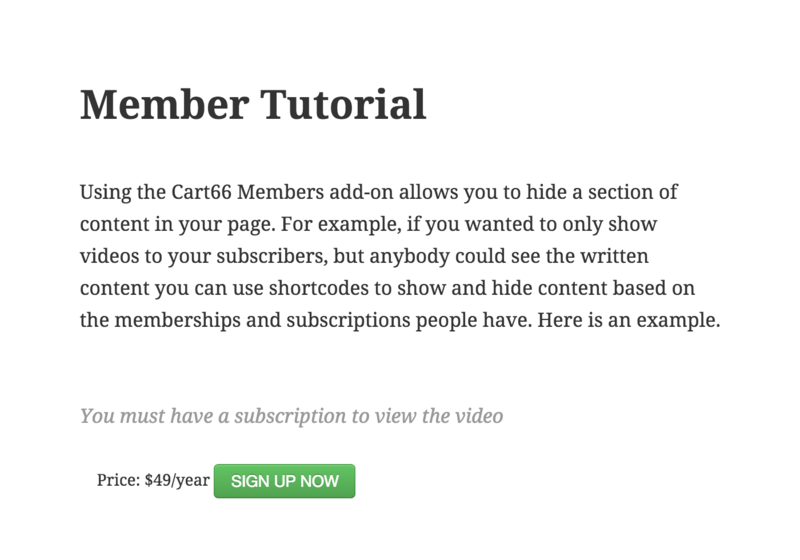 Once you install and activate the Cart66 Members add-on you will have a new menu option under your Cart66 settings where you can configure the content restrictions for your WordPress site. You can require a customer to be logged in with an active subscription or membership in order to view the content of your site. A customer can have as many active subscriptions as they want. All of this is connected seamlessly to your Cart66 Cloud account where you customers can update their billing information securely. 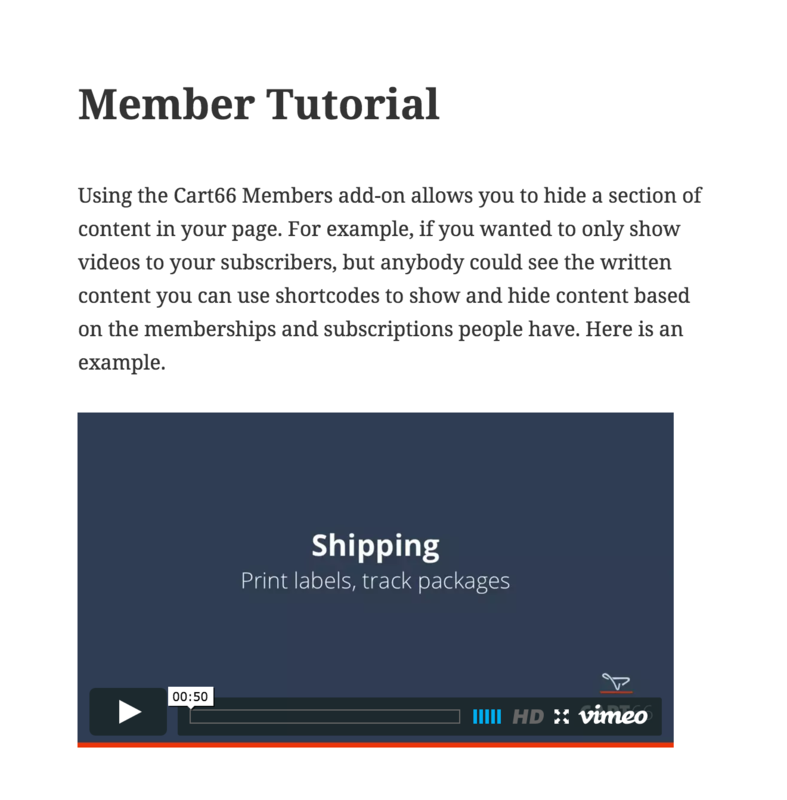 The Cart66 Members add-on is simple to use but lets you do some interesting things with the tools it provides. 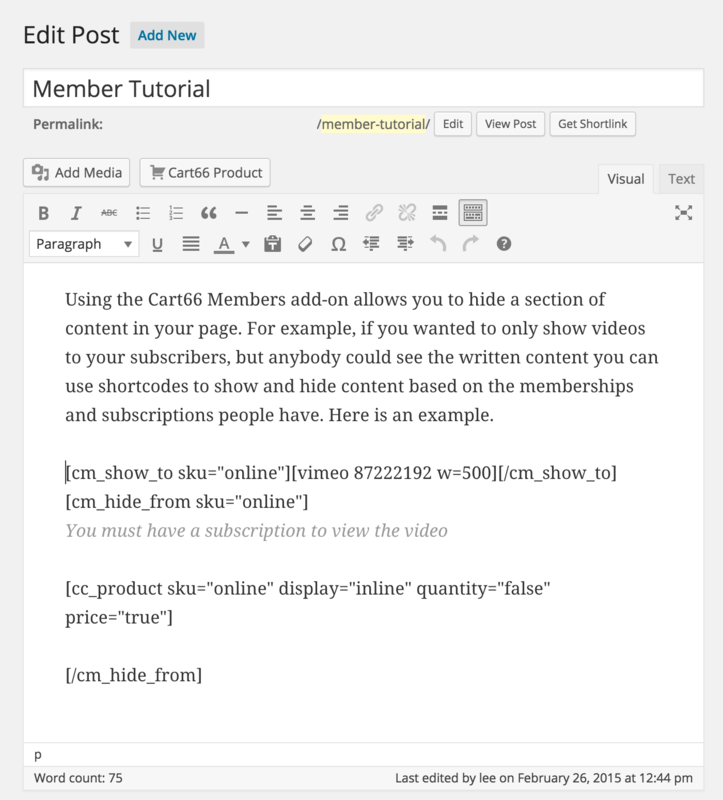 For example, if you only want paying members to have access to your videos, but you want the written content available to everyone, you can use shortcodes to show and hide the content. If a visitor doesn't have access to the premium content, you can put a Cart66 Button on the page to encourage sign ups. Here is an example. If you'd like to have an entire page only be accessible to members you can do that too. Cart66 Members adds a metabox to each page and post of your site. Just click off the memberships that are allowed to view the post. If the post is open to the public, don't select any memberships. The membership metabox allows you to require one or more memberships to view a page or post on your WordPress site. You can provide membership access to an entire category of your posts. This is a great choice if you want to sell access to a growing list of tutorials or articles. Simply require membership access for a particular category, and all the posts in that category will be restricted to members only. In the Cart66 Members settings you will see a list of all of your blog categories. Under each category is a list of all of your membership and subscription products. 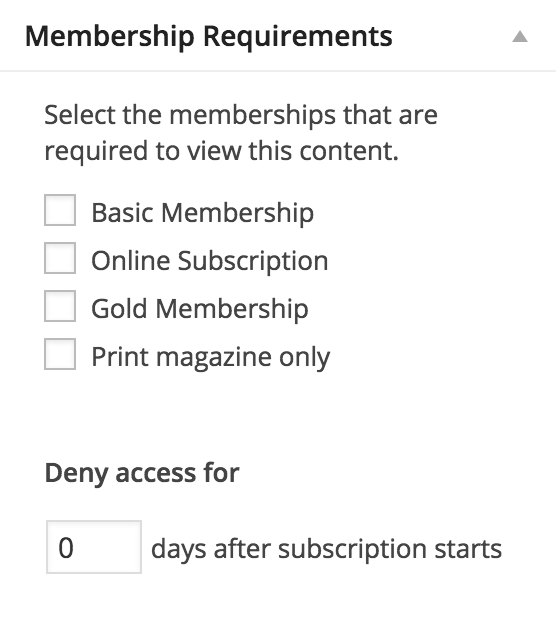 Just click the memberships that are allowed to view each category. If you want a category that is free to the public, do not select any membership requirements for that category. When restricting access to post categories you have two options for how to handle posts for which the current user has no access. 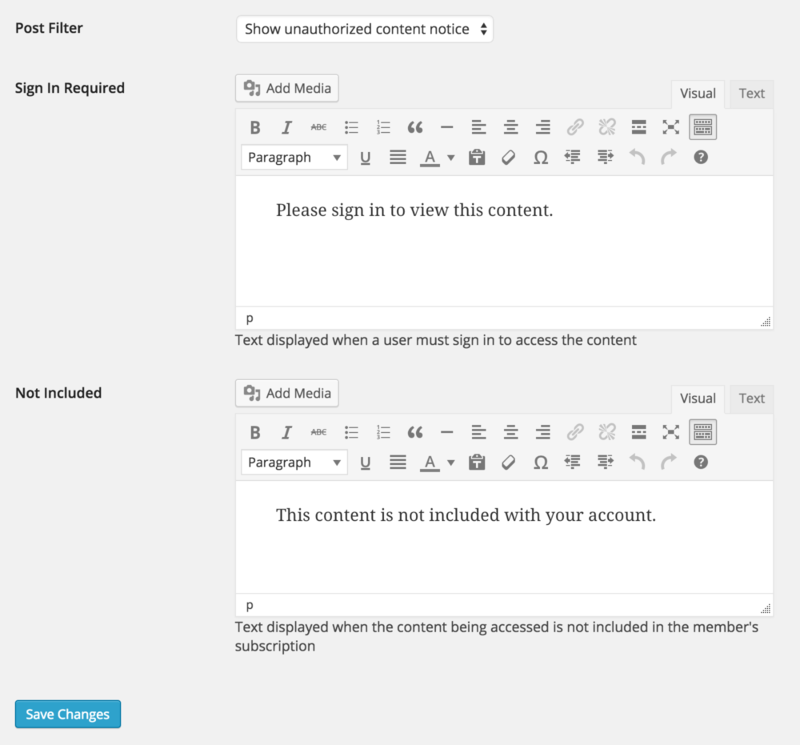 If you choose to remove the posts, then the posts will be completely removed from the WordPress query and will appear to not exist at all if the visitor does not have access to view them. If you choose to show the posts, then the visitor will see the post titles but the content of the post will be replaced with a customizable message about not having access to view the content.